Brandon and Jerry continue the discussion with author and pastor, Mike Bullock, on the best explanation of love in a world that has cheapened the word. What is Love – Baby Don’t Hurt Me? You may have heard the 1993 hit song “What is Love?” by Haddaway. The lyrics open like this. The majority of the song repeats combinations of that phrase. It is a dance tune after all. Mike shares how our world seems to have cheapened the word “love.” We use it to describe a food we like, “I love pizza!” We use it to describe our excitement over things like a new car, new computer, jewelry, etc. Focusing on the use of the word love probably has led to the best explanation of love we’ve ever heard. Love accepts both the good and the bad in a life lived out together as one. The Best Explanation of Love starts with understanding the power behind the word. 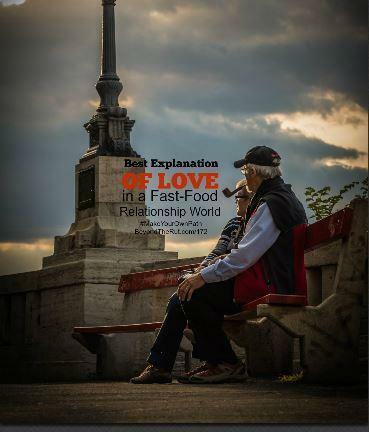 Reading what is love explained through The Missing Ingredient: Home-Cooked Relationships in a Fast-Food World provides one of the best explanations of love. Are you stuck in a rut with your own marriage? Unless there is abuse happening, it may not be time to throw in the towel. The what is love answer is not so much about what you are getting out of the relationship, but what you are pouring into it. 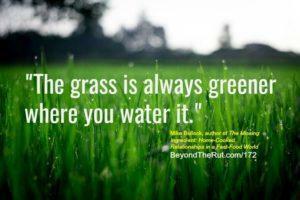 The grass is always greener where you water it. When you sacrificially and lovingly pour into your spouse, watch how she responds. It may surprise you. Change won’t happen overnight. There will be resistance even. Your marriage didn’t get into a rut in one night. It took time and effort to neglect each other, to put up barriers that weren’t there in the beginning. That’s probably the best explanation of love we can give here without giving away the gold that is in this week’s podcast episode. Mike Bullock is a devoted husband to his beautiful wife, Angie, and father to their amazing son, Zach. An imagineer at heart, he loves using his international award-winning material to provide creative learning programs to countless schools and public libraries. In his free time, he’s led and taught numerous groups, from young children to teenagers and adults. His own childhood wounds have driven him to passionately seek the protection and edification of the family unit. Listen to Part 1 of this conversation at BeyondTheRut.com/171.